In the official view the Persian ambassador long outstayed his welcome. Diplomatic negotiations concluded and he should have been ready to leave - the gazettes affirmed it, the Court wished for it, the Hall of Mirrors in Versailles was left in a state of readiness for his departure. But, happily ensconced in the Hôtel des ambassadeurs, rue de Tournon, on expenses of 500 livres a day, Mohammed Reza Beg was in no hurry at all - to the exasperation of the duc de Breteuil, he and his entourage of forty men proceeded to make themselves thoroughly at home and managed to remain in Paris for a whole six months. Parisians, of course, had an insatiable curiosity about this exotic personage and many picturesque details of his everyday life during his stay in Paris survive. The following is summarised from M. Herbette, Une ambassade persane sous Louis XIV (Paris, 1907) a old book based on original memoirs which picks up nicely the harried bemusement of the French officials charged with the Persians' care. Every effort had been made to make the Hôtel conform to Persian tastes. His Excellence demanded certain modifications. The tapestry which adorned the room set aside for prayer had to be changed because it had human figures. The beauty and softness of the bed reserved for the ambassador persuaded Reza Beg to keep this piece of furniture which was unknown in his country. His men in contrast remained faithful to Persian customs and were each furnished with a mattress which could be laid out on the carpet, with sheets, covers and pillows. The oriental custom of sitting cross-legged on the floor with cushions simplified the problem of seating. Divans were placed along the walls for the ambassador's guests to sit on. To provide illumination His Excellence brought with him his own lamps, in the form of huge goblets filled with pieces of wax "like sugar in coffee" which were constantly replenished by a valet. The resulting smoke did not inconvenience the Persians seated the floor but caused terrible suffering to their French guests who were that much higher up on the divans. More costly to the Royal Treasury was Reza Beg's demand for frequent baths, a extraordinary custom which Courtiers and enlightened spirits soon desired to imitate. On 10 Febuary he was taken to the public baths "chez le sieur du Buisson, baigneur" but the charge of 100 livres a time soon proved excessive and Breteuil reluctantly consented to installing facilities in the Hotel itself. Creating a branch on the main water conduit from Arcueil to Paris cost a cool 100,000 francs. Such was public interest that an engraving was produced of His Excellence in his bath. Reza Beg is depicted emerging from a sort of oblong case, with two servants in attendance with towels and clothing. His pipe and coffee await him on a table. 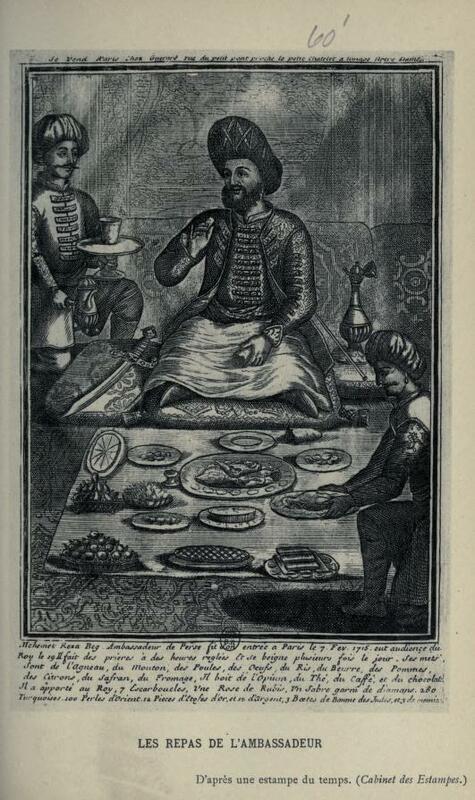 The caption reads: "Mehemet Riza Beg, Persian ambassador, baths frequently and in very hot water: he stays there for six hours. He goes in naked and gets out the same, apart from a little pair of shorts; he is bareheaded. At this moment they are building baths for him in the Hôtel des ambassadeurs." Even more amazing was the Persians' food consumption. According to official accounts the king furnished the household each day with "three sheep, a lamb, twenty chicken, all still alive, 50 pounds of butter, 50 pounds of rise, 25 pounds of honey, 10 pounds of apples, six lemons, 10 pounds of salt, 30 pounds of flour, 10 pounds of cheese, 6 dozen eggs, 3 pounds of spices, 8 pounds of coffee, 8 pounds of chocolate, half-a-pound of tea, 15 pounds of sugar, 10 pounds of tobacco, a pound of saffron, 100 pounds of bread, 10 pounds of suet, 30 pints of milk". This gargantuan list appeared to confound Chardin's observation that Orientals, in their hot climate, ate less than Europeans, though the cause was more the size of the Persian entourage than the heartiness of their appetites. Nothing was allowed to remain indoors overnight; all the leftover food was thrown away, or resold (the Persian cooks soon gained a reputation for profiteering). The meat was slaughtered en place according to strict Muslim rules of purity and only Reza Beg's own men were allowed to serve him. The ambassador's personal consumption was modest. The duc de Breteuil, who often dined with him, remarked that he had never known a man finish a meal so quickly. He was indignant that the Persians had no knives and forks but ate with their fingers. From time to time a servant would present his master with a sorbet in a porcelain bowl with a wooden spoon. After the meal the ambassador would wash his hands, then his mouth in a silver basin and finally carefully wipe his beard. French observers soon found that ritual and prayer, rather than food, were His Excellency's main preoccupation. They suspected that the obligation to pray five times a day was a convenient pretext to eject abruptly unwelcome visitors. The ceremonial attending prayer was long and complicated. The ambassador passed into a specially reserved chamber, took off his shoes and undressed to his shirt, pulled up the sleeve to the elbow and donned a plain white cotton turban. In the cold of the Parisian winter he allowed himself a lamb's wool jacket over his arms. After suitable lustrations, he proceeded to prostrate himself on his prayer mat, with its depiction of Mecca. The paraphernalia of Muslim prayer was entirely novel to French observers, but they were generally impressed by the zeal and humility of his devotions. Even in 1715 a curiosity about everything and a hunger for novelty readily gripped educated Frenchmen and they viewed with incomprehension Reza Beg's total lack of interest even in the splendours of Versailles and Paris. The duc de Breteuil declared that it was difficult to understand how a man from a distant land with such different customs could show so little curiosity and concluded that he feigned indifference out of vanity. After the audience at Versailles, there was little reason to reserve forty horses for the ambassador, so a coach was placed at his disposal. This did not go down well - whenever he sallied forth Reza Beg insisted on his full entourage of guards, mounted standard-bearer, pipe bearer and the rest. This was all very well for a carnival, remarked the duc de Breteuil; for a trip to the baths, it was simply ridiculous. An itinerary of outings - to Les Invalides, Vincennes, the Louvre - met with little enthusiasm. At Saint-Cloud he abandoned the duc d'Orleans as soon as dinner had finished. A tense moment ensued at the Opera when one of the Persians refused to disarm, threw the hat and wig of the guard to the ground and drew a knife on him. 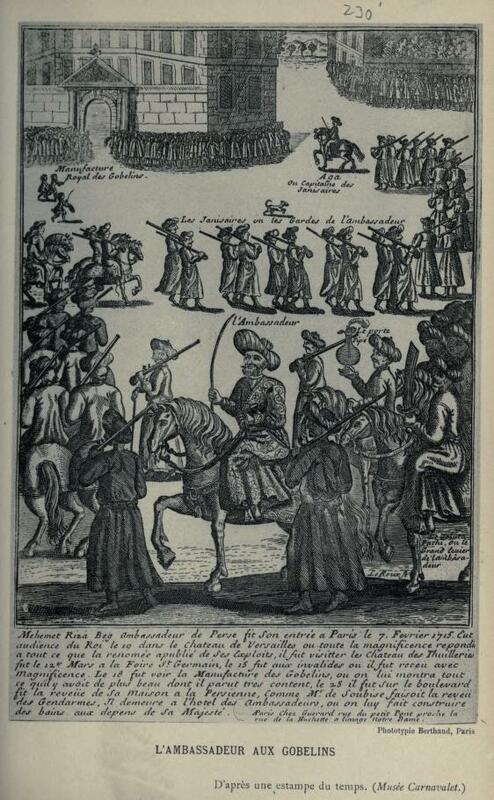 Louis XIV himself intervened to insist that Reza Beg should control his men better in future. The Persians much preferred to pass their time in their native sport of djeryd baz, a game played on horseback which involved opposing sides launching javelins at each other. The crowds of spectators who gathered on the walls to watch resulted in unfortunate incidents which required all Breteuil and Saint-Olon's diplomatic skills to resolve and even excited the intervention of the king. Reza Beg demanded redress when a Persian servant was beaten about the face by an infantry lieutenant that he had insulted (15th March). 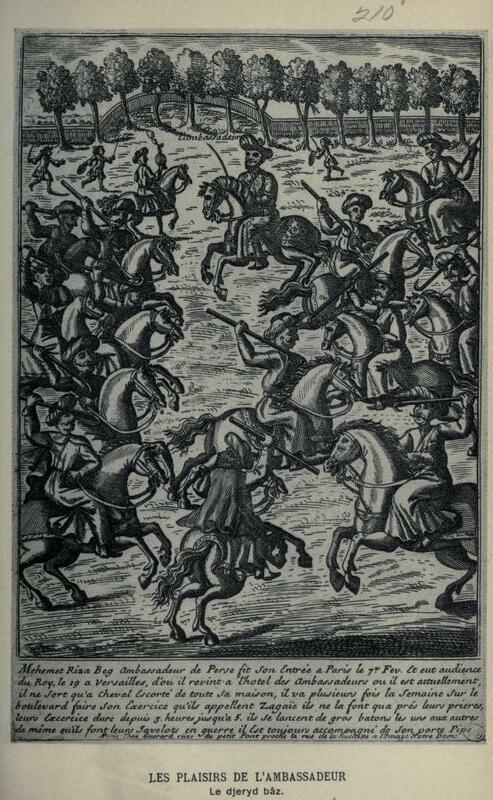 In another a spilled coffee led to a fracas in which swords were drawn (23rd May.) As a result Parisians learned to keep their distance. Visitors continued, however, to flock in abundance, among them many "women of quality" whom our ambassador was happy to entertain. At these receptions men and women were admitted separately, coffee and sorbet were served to the sound of violins, with the host seated on the carpet smoking his pipe. His Excellence, it would seem, was not immune after all to one French tradition, the "intrigue galant". His most scandalous liaison was with a certain Marquise d'Epinay, a pretty - and possibly married - young woman of seventeen, whose mother abetted the liaison in mercenary fashion. At first conducted quietly the affair was soon the subject of gossip and public notoriety. However it must have been true love, for the ending is the stuff of fairy tales!. When the embassy finally left France it was feared that Madame d'Epinay, by now in the early stages of pregnancy, would attempt to follow; d'Argenson, the lieutenant de police was tipped off by her mother to intercept. The lovers hatched a subterfuge; Madame d'Epinay took the stagecoach to Rouen where she met up with the boat carrying the Persian luggage and managed to get herself smuggled on board ship at Le Havre in a great chest. The pair then embarked together on the epic return journey via Hamburg, Berlin and Danzig,then overland across Poland and Russia and finally to the frontiers of Persia .In January 1716 Madame d'Epinay gave birth, though the fate of the child is not recorded. 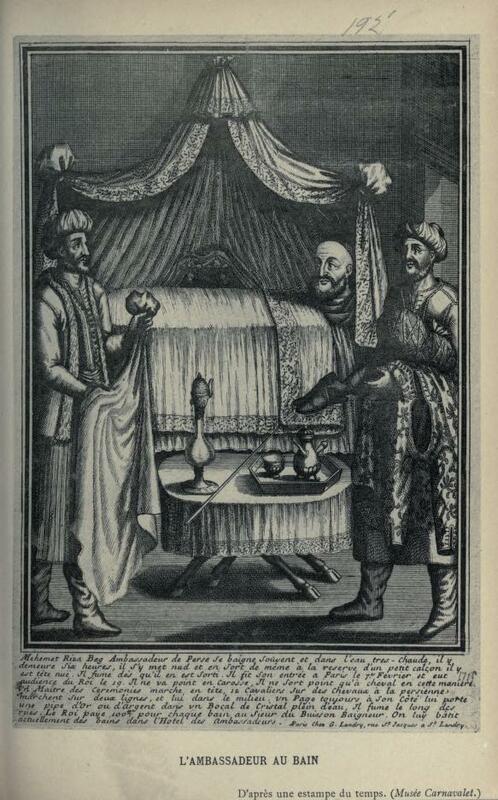 In May 1717, following a palace revolution in Persian, the unfortunate Reza Beg took poison and committed suicide. But Madame d'Epinay did not give up She converted to Islam and is last glimpsed in the company of her lover's brother heading for Isfahan to deliver to the Shah what remained of the Sun King's gifts. What finally happened to her, I wonder? M. Herbette, Une ambassade persane sous Louis XIV. Paris, 1907.